Table tennis is a very technical and tactical sport. 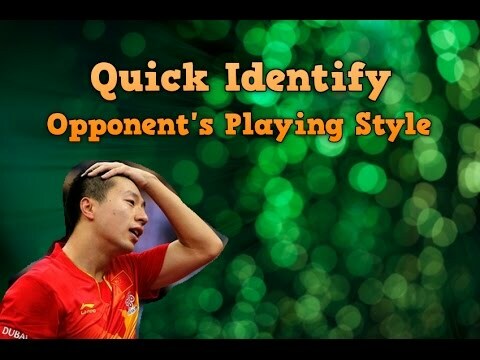 During a match, you must quickly identify the playing style of your opponent. Then you can find a good tactic & strategy to win your game. Find good tactics to counter his strength (that’s why you need a coach). In table tennis, there are many playing styles: looper, two wings looper, hitter, block and one wing looper, penhold short pimples hitter, penhold looper, reverse penhold backhand RPB player, defender, modern attack defender, long pimple blocker, puncher, long pimple defender, close to the table quick attack, push-control, driver, etc. With this information, you can pre-plan good tactics, where to serve, and where to attack. Think about it, and you get confidence. He uses forehand grip. His index finger is a little high. Right foot is well behind the left. Look at his ready position during warm up. Forehand player has 3 weak spots: Long at his backhand side, and short and long at wide forehand. If you keep serving long at his backhand side, he is forced to use his weaker side (backhand) to answer your serve. If he wants to use his strength (forehand), he needs to step around. That’s why the serve (short and long) at his wide forehand will make him surprise. You can win the point directly or get the huge advantage to attack the next ball. By mixing up these 3 weak spots, you will reduce greatly his strength (forehand pivot attack). A backhand favorite player will have these characteristics. You can easily spot it out during the first set of the match. A backhand dominant player uses backhand grip. His thumb is moved very high to the handle. Stands near the center of the table. They stand in the middle of the table to use his backhand attack. The weakest point of the backhand player is his elbow. You should serve to move his elbow around. By doing this, you make them under pressure, and reduce the quality of their shots. You serve long to his backhand side to force him to move to his backhand corner. And then serve long directly to his elbow, will make him move. He hesitates at this point, to use the forehand or the backhand. Serve short to the forehand side also remove this initiative backhand attack, and force him to move further to the right. And then you attack to his left (backhand) to win the point. This article gives you a guideline, how to serve, where to serve to 2 principal playing styles. You can easily quickly identify your opponent. There are many other tips to counter various playing style. Like how to counter left-hander, how to counter blocker, hitter, anti-spin or long pips player. I will explain it later. Where i have serve in a doble game? What a best serve for doble game? For double game, you should serve short with sidespin. If your teammate is on your left, serve short with pedulum serve. So then the ball is returned to your teammate position, so then he can attack the next ball. Search “table tennis serving rule pingsunday” for this explication.